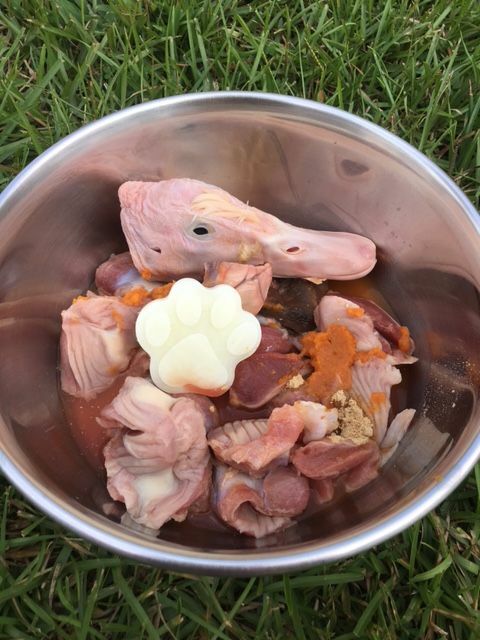 As I explained in my last post, raw meaty bones are an essential part of feeding your dog a balanced, raw food diet because they contain everything that’s needed to maintain your pup’s skeletal and dental health. While that’s good to know, you might wonder where to buy chicken leg quarters, duck heads and the like at affordable prices? Well, today I’m going to tell you just that. 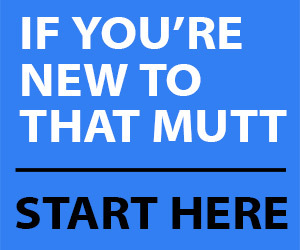 -Raw Feeding Miami, an online raw dog food supplier. -Food Lion, my local grocery store. My number one tip in your search for affordable raw meaty bones is to compare prices between online raw dog food retailers and brick and mortar stores. One thing you’ll have to keep in mind is that online retailers will charge you a shipping fee, so you’ll have to add that into the final price. That fee will typically depend on how far away you live from their warehouse. If you’re lucky enough to live in their greater metropolitan area, you can save on shipping costs all together by picking your order up in person. My favorite online retailer for raw meaty bones from more “exotic” protein sources is Raw Feeding Miami. Their protein selection goes far beyond what I can find locally. Items of interest for me are mainly duck feet, necks, heads and frames, but I also purchase the occasional rabbit head and stuffed quail. Raw Feeding Miami’s warehouse address is 18350 NE 2nd Ave, Miami, FL 33179. Pick ups from them are by appointment only. They ship on Mondays, Tuesdays and Wednesdays, so it’s important to place orders in advance if you don’t want to run out of dog food … been there, done that. Whenever that happens and I’m waiting for the order I placed to arrive, I’m opting for pre-made raw dog food. Shipping fees from Raw Feeding Miami orders depend on the distance the package has to travel – mine are usually around $26 to get from Miami to Spring Lake, N.C., via FedEx Home Delivery. I know of another online retailer that charges a $25 flat rate shipping fee, but their raw meaty bones are considerably more expensive than those from Raw Feeding Miami. So given the topic of affordable raw meaty bones, I won’t mention them here. Raw Feeding Miami has a customer rewards program where you collect points with every order placed that can be turned into discounts towards future orders (e.g.1000 points will get you $10 off). 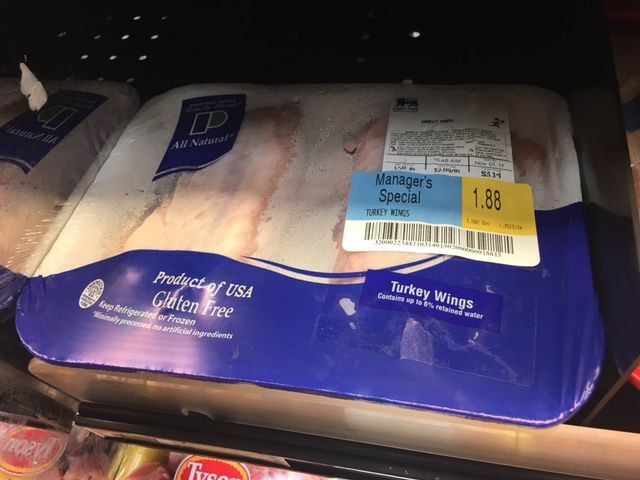 While Raw Feeding Miami also carries the more standard in-bone meats like turkey necks and chicken leg quarters, I can get those from Food Lion at a very decent, even slightly better, price. The only downside of buying chicken leg quarters locally is that I have to remove their skin because it’s way too fat to feed my dogs. The raw dog food supplier takes care of that for you, but I’ll gladly remove the skin myself if doing so will save me a few dollars! Another way of saving on raw meaty bones at the grocery store is to be on the lookout for sales. I just came across a 1.5 lb package of turkey wings that were marked down to $1.88. 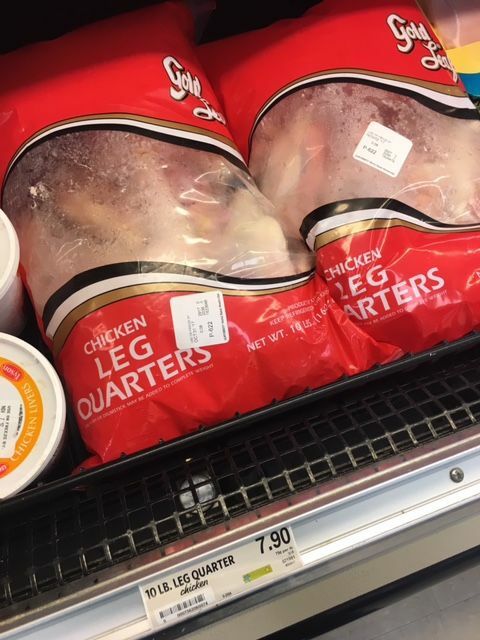 I can also get 2 bags of chicken leg quarters for the price of one when they’re on sale, which happens about once a month. As mentioned above, one 10 lb bag costs $7.90 which is already a pretty good deal, but obviously getting two bags for the price of one makes that deal even sweeter. It’s also worth looking into your local ethnic grocery stores. Asian grocery stores are more likely to carry what us Westerners would consider odd cuts of meat. I’m thinking chicken or duck feet and fish heads. I just recently discovered two frozen salmon heads at a Korean-owned fish market/grocery store in Fayetteville, N.C. They each weighed almost 2 lb, cost around $5.00, and were a huge hit with my dogs. Also check out your local farmers markets. They might just sell odd cuts of meat as well, even when they’re not on display. It doesn’t hurt to ask! 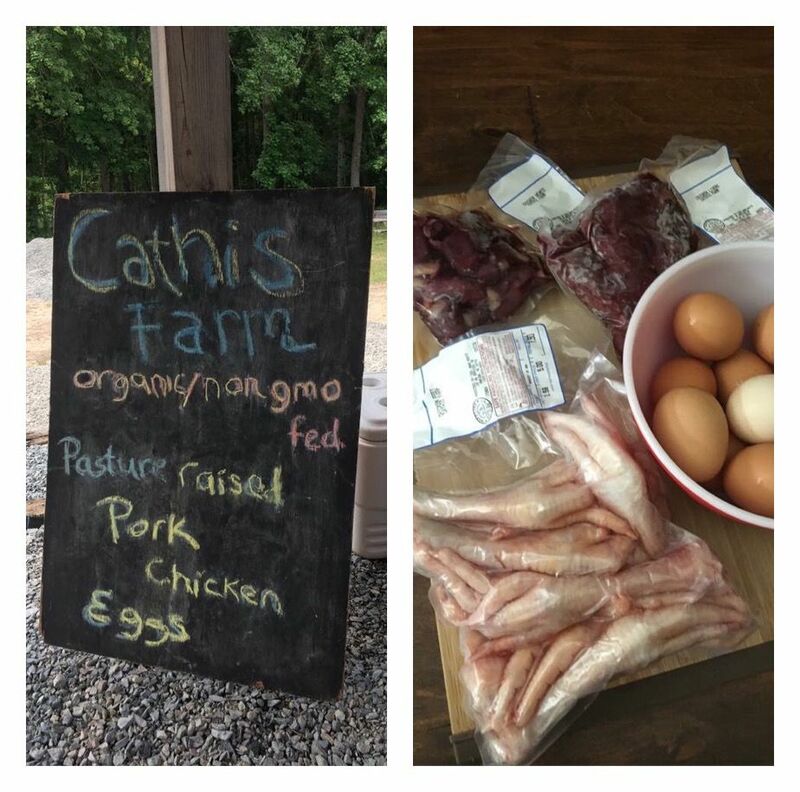 I found out about a local organic farm this summer that sells chicken feet. The farmer explained that most people buy them to make bone broth, which is certainly also a great way of using them. Rest assured that Missy & Buzz ate them as an in-between snack to fuel their joint health (they’re chock full of glucosamine, chondroitin, collagen, and trace minerals). They were $5 per lb which is a bit more expensive than Raw Feeding Miami, but they were organic and sourced locally, so I was ok paying that price. I’ve also heard that some Walmart stores carry chicken feet, although the one closest to me doesn’t. I have yet to try my luck at a few other ones, but it’s on my to-do list. I’ll report back once I will have found them at Walmart. 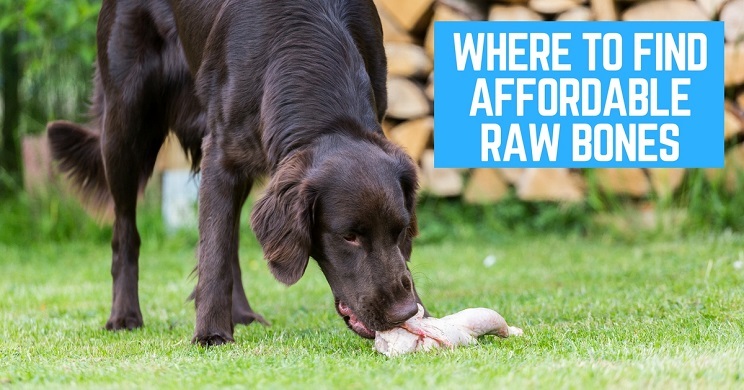 Buying raw meaty bones to prepare your dog’s raw meals doesn’t have to break the bank as long as you’re willing to compare prices and be on the lookout for sales. If you know of fellow raw feeders in your area, consider placing a larger order together with them. You’ll be able to at least save on shipping. 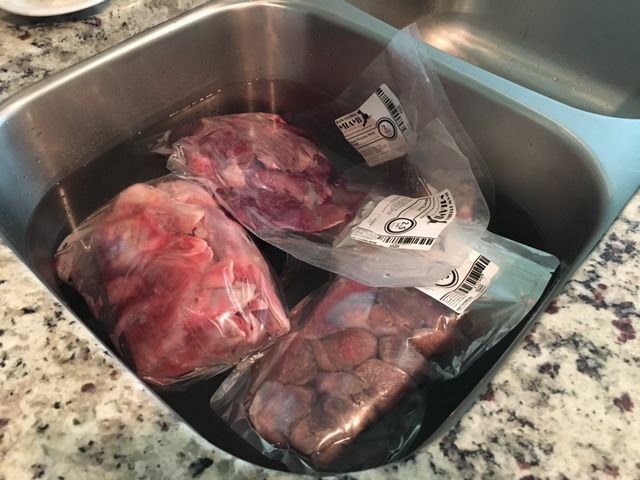 One of my dog walking clients just transitioned their German Shepherd to a raw diet and placed their first order with Raw Feeding Miami to try them out. I’ll definitely be suggesting placing orders together every now and then. If you don’t know of any raw feeders in your area, you could join a raw feeding Facebook group to find out if any of their members live close by and whether they’d be interested in placing a group order. They might also be willing to share local sources for affordable cuts of raw meat. Do you know of another inexpensive way of sourcing raw meaty bones? I’m in Arizona and love Red Angel Raw. I meet once a month at a parking lot to pick up for $10 for the whole order in my name which is 3 or 4 people. I ordered once from Texas Tripe which was reasonable. Also Creston Valley Meats when I’m in California. Wow, $10! Is that a typo? I buy raw beef knuckle bones from my butcher for $3.50/lb. This isn’t the cheapest option but it is the most convenient, and they do up my 80/10/10 base for me, for $2.50-$3/lb, which means it only costs about $100 PER MONTH for me to feed my 76 lb German Shepherd raw, with very little work (this total is an estimate adding in supplements and extras). They grind, freeze, portion, and store the meat base for me. I pay in bulk pricing and pick up what I can store (about half an order at a time). So any additional business I can throw their way, including buying other products from them – I do. In the Twin Cities area, we are also lucky to have Raws for Paws, Safari Pet, and Woody’s Pet Food Deli, among others. Anything under $100 is a great deal, I think. And convenience is really important for me too.